They say football is a game of two halves: and so is my review of Mission Impossible: Ghost Protocol. 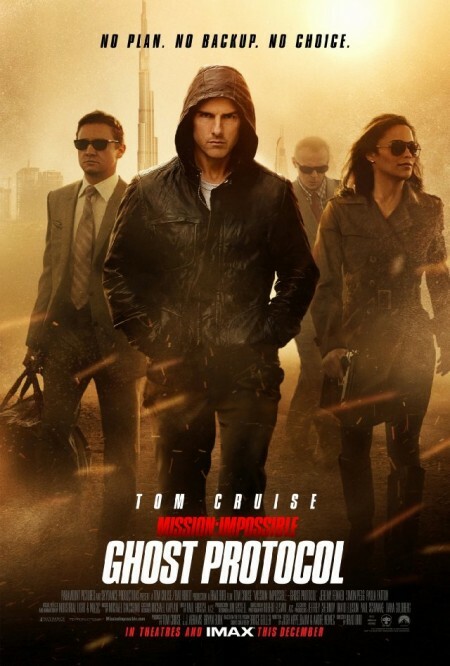 Mission Impossible: Ghost Protocol is an enjoyable movie. It’s populated by beautiful people in exotic locations. It has guns and gadgets. It has explosions. It has chases. It has spectacular high places. It has all the elements of a modern action spy thriller. It has a stand out performance for me was Simon Pegg: Benji is a great foil to Ethan Hunt. Benji is both competent at the technical parts of the job but Pegg manages to infuse him with enough comedy to lighten the films atmosphere. William Brandt (Jeremy Renner) and Jane Carter (Paula Patton) round out the team yet despite being given more back story than Benji get less to do. It’s Not a lot of effort goes into developing the villains whose actions drive the plot with little more justification than they’re a bit mad or are working for cash. It is overall an enjoyable action movie – not a classic but good fun. But is it a Mission Impossible film? On the surface it has the trappings of a film based on the 1960’s TV show: the famous theme music runs over credits that feature glimpses of the action to come while a fuse burns down; there are face masks; there are missions that are impossible; the stakes are high; the secretary will disavow all knowledge etc etc etc. The problem is these are elements borrowed from the series not what made it unique. Week in week out they used to select a team of talented individuals, have a little fun as they showed the gear they’d use, then the stone cold operatives would go into action, overcome some unexpected happenings before Mission: Accomplished they’d ride into the distance. I’ve not kept count but if the current IMF pull off more than 50% of their jobs then I’d be surprised. At least in Ghost Protocol despite hints there aren’t any traitors in the IMF. Oddly one of the elements of the movie I liked the most annoys me as being not MI. Benji is good as the tech guy but he isn’t a Barney. Barney would crack a joke in prep for a mission but on the job? Speaking English, talking about how cool it is to be a spy while walking through the Kremlin? Mission Impossible isn’t about characters who need to wise crack all the time. Leave the one liners to Bond movies. I’d actually like to see if Simon Pegg can play a straight role because I have a feeling he’d be pretty good at it. Jane Carter is another case of not quite getting the original series. I’m glad she can hold her own in a fight like her three male companions. We’ve come a long way from heroines who couldn’t do anything in a fight via Buffy and Alias. Carter shows us that she can fight in Dubai. Yet if I was picking an MI squad I’d take Barbara Bain’s Cinnamon Carter. Why? Because in Mumbai she’d have tricked the guy into giving up the code for the satellite and done it with a ton of style. Frankly I’d like to see the MIF showing a bit more brain and a little less brawn. Not so much running around. Fewer guns. Fewer car chases. By now the IMF should be getting disavowed. And handed their P45s too and looking for jobs as MFI. On the plus side the theme sounds like it’s in the correct time signature. The infiltration of the Kremlin is pretty good till it goes wrong. There are some nice references to elements of the original series dropped in. This is also a smaller, lighter weight IMF at least after Ghost Protocol is invoked who can’t call tech support or the marines. And they don’t throw a traitor in the MIF into the story. So if you’re a fan of the original Mission Impossible series and were hoping for more than a bit of surface ephemera on an OK action film you may be disappointed.